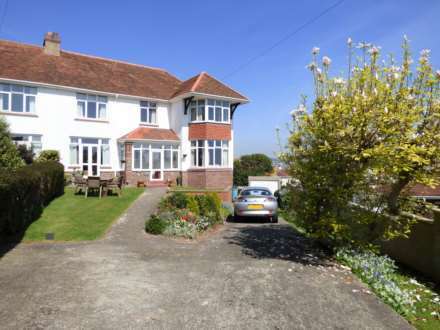 Haccombe is a hamlet betwixt the market town of Newton Abbot and the highly sought after estuary village of Shaldon and offers the best of both worlds, rural and coastal. Newton Abbot boasts a thriving high street, schooling, leisure facilities and shopping along with excellent transport links via both road and rail with a mainline station providing easy access to the capital. Shaldon offers a lovely array of boutique shops, bistro`s, and galley`s and is well known for its high prices and beautiful beaches. The popular Coombe Cellars public house and restaurant with its river frontage, jetty and slip are within a short drive. For the outdoor lover, Dartmoor National Park is within easy striking distance as is too the Torbay village of Maidencombe. Accessed via a private driveway, this splendid Grade II Listed Georgian House was converted in the 1980`s and is located at the head of the Haccombe Valley. The apartment is located on the ground floor in the left wing of the house and is accessed via a pillared terrace, with secure entry system, and opens into a shared hallway. A private front door leads you into number 12 and each room opens off a spacious hallway and comprises of one double bedroom, bespoke country style kitchen, living room and bathroom. With high ceilings, original sash windows, window seats, shutters and some cornice work, it has kept its period charm and character. A real benefit are the lovely communal lawned gardens for all owners to use along with private and visitors parking. Coved high ceiling with inset down lighters. Access to partially boarded loft storage space with pull down ladder, light and period cornice and ceiling rose. Cupboard housing the electric meter box. Telephone intercom entry system. Electric night storage heater. Large sash window to the front with window seat and wooden shutters (not currently in use). High coved ceiling. TV aerial and telephone points. Recess with shelving. Bespoke country style kitchen with a range of freestanding units and dresser. Double bowl ceramic sink with miser tap housed in a wooden cupboard unit. Space for slot in cooker and fridge/freezer. Wall mounted cupboards. Tiled splash backs. Slate tiled flooring. High ceiling. Large sash window to the front with window seat and wooden shutters (not currently in use). Large sash window to the front with window seat and wooden shutters (not currently in use). Two recessed areas with shelving. High coved ceiling. Electric night storage heater. TV and telephone points. Coloured suite comprising of a panelled bath with shower screen and fitted with electric shower over. WC and pedestal wash hand basin. Extractor fan. Tiled walls. Haccombe House is accessed by it`s own private driveway with visitor`s car parking spaces just outside the main entrance, opposite Haccombe Church. As you come up the sweeping driveway leading to a large resident`s car parking area, where this property has an allocated space outside the apartment. There are level sweeping lawns to either side with hedging borders. The communal grounds are for all residents to share and enjoy without the hassle of the year round maintenance. Leasehold Information: The lease term is 999 years and the commencement date is 25th March 1982. The service charge is approximately £128pcm and includes: water rates, maintenance of communal gardens, maintenance of communal and external parts of the building and buildings insurance. Ground Rent £25 per year. From the Penn Inn roundabout, the exit signposted Combeinteignhead, proceed up the hill and continue for approximately 1 mile in to the hamlet of Netherton, take a right hand turn signposted Haccombe and follow the road for approximately 1 ¼ miles where you will see Haccombe House ahead of you.